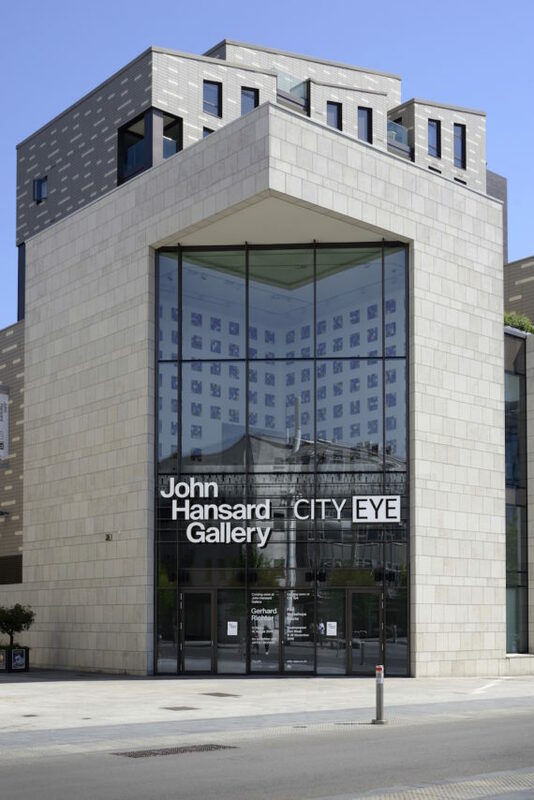 Southampton's John Hansard Gallery has a new home in a brand new building in the city's 'Cultural Quarter' and its first major show is a Gerhard Richter retrospective that draws extensively from the Artist Rooms collection. Fisun Güner is impressed by the art, ambition, and some of the architecture. A tinted glass wall, framed by smooth limestone bricks that form two angled and inverted L-shapes, is the quietly elegant frontage of the new John Hansard Gallery. Facing its new home, and separated by the grey expanse of pavement of Southampton’s Guildhall Square, you’ll find the restrained art deco grandeur of the Civic Centre; adjacent to it, and separated by a paved alley filled with diners from the restaurant/café opposite, is the gallery’s architectural twin, the new Nuffield Southampton Theatres (NST) venue, at its new address now known as Studio 144. Though not connected commercially to the NST complex, the café occupies the ground floor of the theatre venue. 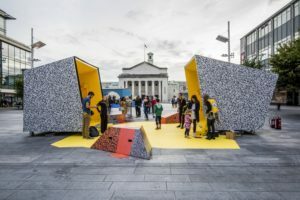 Both buildings are the latest additions to Southampton’s Cultural Quarter, which it’s hoped will transform the fortunes of the Hampshire port city, just as the smaller south coastal towns of Hastings, Margate and Folkestone have been bolstered by investment in the arts in the last decade. 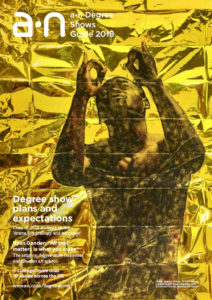 For its first major exhibition, the Arts Council England-funded Southampton University gallery certainly has a headline name. 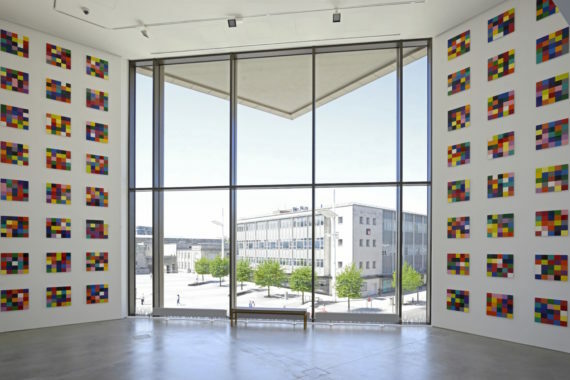 But even before you enter the building, which the gallery shares with film organisation City Eye, you can see Gerhard Richter’s multiple colour chart panels through the glass, hung in grid formation in the impressively high-ceilinged, front-facing gallery. By the time the exhibition opens to the public on Saturday, however, the huge curtain window will be mostly covered with colourful posters advertising its programme. As soon as you step through the portico, you’re almost instantly in the shop (commercial interests prevail again, naturally), which doubles as a foyer and reception. 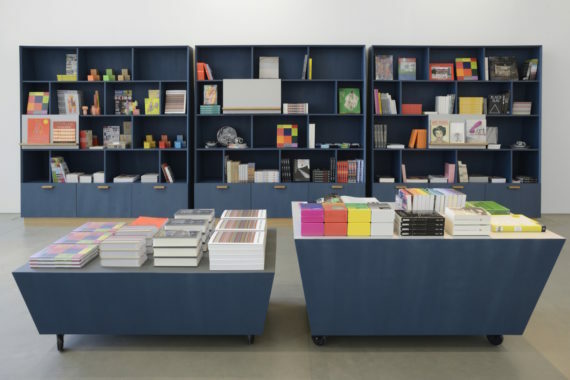 Indeed, the space works overtime to provide a performance/events space when needed: the book racks and display cases have inbuilt wheels for effortless transformation. This flexibility is evident throughout the galleries: the ground floor gallery is currently divided by a temporary wall, while on the upper level two permanent galleries are turned into three, with arched portals connecting them and providing a through-vista. At the rear of the building there’s a charmingly kitted-out children’s art and activity room, its huge windows overlooking a public park, filling the room with light and colour. John Hansard’s director Woodrow Kernohan has schools and public engagement very much in mind, having come together with Southampton Council’s highway department to commission the Colourful Walkway Project. 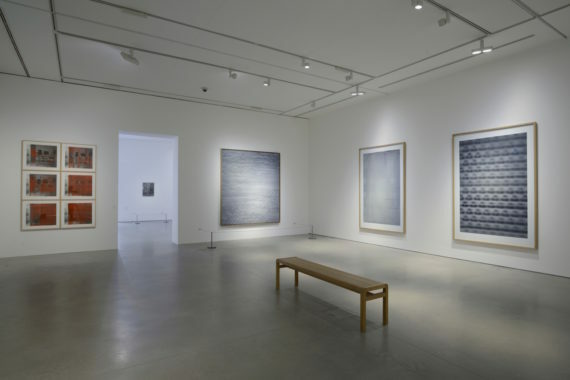 For this, local schools will shortly be invited to respond to the Richter exhibition by designing pavement tiles, which will eventually form a permanent walkway outside the gallery. Meanwhile, the gallery’s mezzanine level provides space for adult learning resources to accompany each exhibition. Glass and light are distinguishing features of the interior spaces, which have been designed by architect Glenn Howells, with the exterior the sole preserve of CZWG Architects. But what promises to be flashier from the outside doesn’t hold true inside with its grey lino flooring and the cost-cutting look of the drably dark-stained wooden stairwell. These seem disappointing choices given the bold ambitions of the Cultural Quarter, and you do start to wonder just how closely the two architects were working in concert. This aside, the exhibition programme clearly sets out to kick things off with a bang, with loans for the Richter show from Artist Rooms (a touring collection of work by some 40 modern and contemporary artists which is owned jointly by Tate and National Galleries Scotland), as well as from Tate’s non-Artist Rooms collection and from Richter’s own private collection. 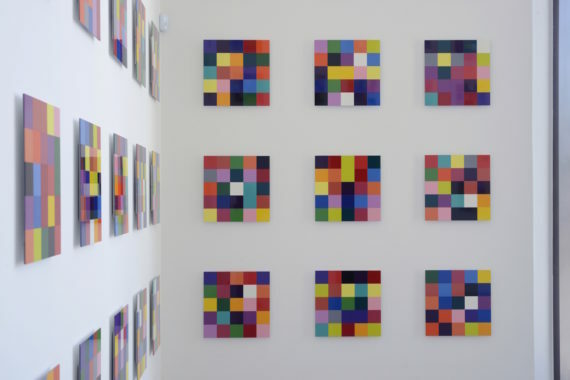 In the first gallery hang four exquisite tapestries, each replicating, onto a quarter of the fabric, a different quarter of one of Richter’s abstract squeegee paintings. In each tapestry the pattern is mirrored horizontally and vertically, resembling a Rorschach. But in their neat colourful geometry what’s also suggested is an Islamic carpet, so hence, one might guess, the title of each tapestry: Abdul, Yusuf, Iblan and Musa. The theme of replicating and mirroring runs throughout, with work dating from the 1970s to more recent years. 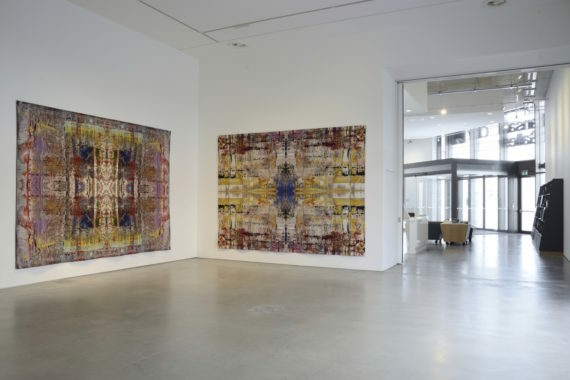 The tapestries date from 2009, while the original Squeegee canvas (from a series of paintings Richter produced using a Squeegee blade to effect a textured surface of scraped paint and fuzzy edges) is from 1990, though it’s not shown here. An earlier painting of leaves and undergrowth is photographed and projected as an enlarged image and reproduced in paint as if a facsimile, four times the size of the original. More recent paintings are simply photographed and printed to their original size, with their images then replicated onto glass, including the small painting September, which looks vaguely like an image of a plane crashing into a tower, though any resemblance to 9/11 was apparently accidental and the title came later. On the upper level are Richter’s painted mirror panels. Opaque pigments are painted on the reverse of the glass to reflect the room as a silhouette, though these surely have to be among his least interesting work. 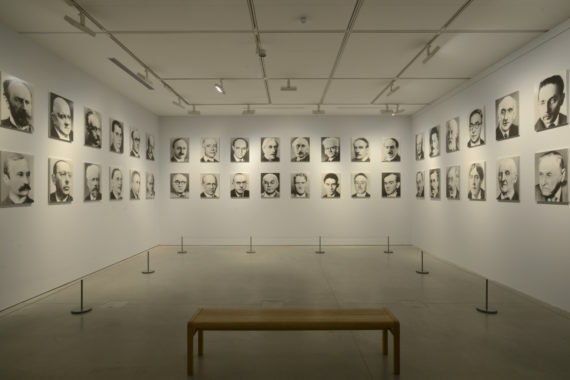 The highlight is surely 48 Portraits, the black and white portraits originally painted from photographs of towering male figures of the 19th and 20th centuries. 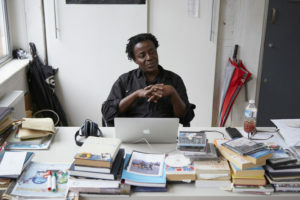 The 48 portraits here are not, however, the series first shown in the 1972 Venice Biennale, but are photographic facsimiles made over two decades later. Here, in this hushed, dimly lit gallery, they remain just as intriguing and compelling.